Drug shortages happen, both nationally and internationally, for many reasons. Most are related to manufacturing, shortages of raw materials or distribution issues, but occasionally shortages occur because demand for a drug increases unexpectedly. Drug manufacturers are often limited in their abilities to adjust production quickly, especially for strictly controlled drugs like opioids or other narcotics, or for drugs manufactured through biological processes. At any given time, there may be thousands of drug shortages listed on the national drug shortages website. 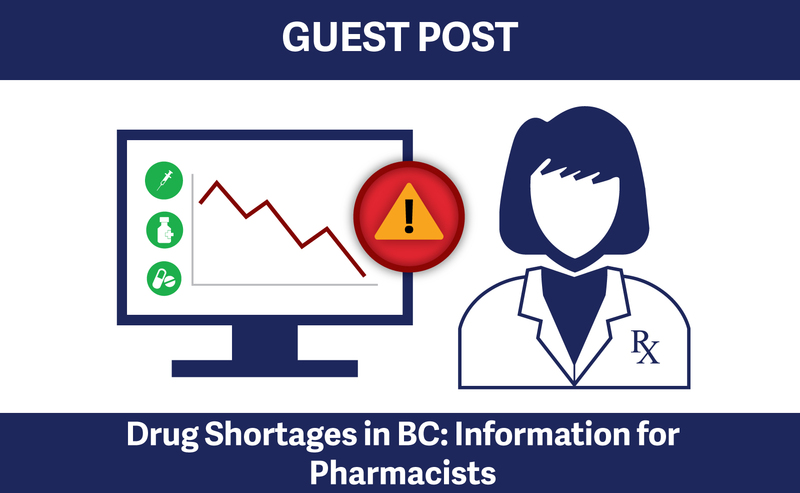 However, not all shortages necessarily affect pharmacies in British Columbia, as distributors may have sufficient stock to weather a shortage without difficulty. Some shortages last a matter of days and are largely unnoticeable. Shortages that affect drugs covered by B.C. PharmaCare plans are noted in the Drug Shortages Lists, located on the B.C. Drug Shortages web page on the PharmaCare website. These lists are available to pharmacists, other healthcare professionals, drug distributors, manufacturers and the public. The Current Drug Shortages List provides up-to-date details on all shortages of drugs covered by PharmaCare, as reported by BC community pharmacies and confirmed with the manufacturers and wholesalers. It includes alternatives PharmaCare temporarily covers during the shortage. The Resolved Shortages list shows which shortages have been resolved recently. The lists are in Excel files that are sortable on drug name, chemical name, and date reported, allowing for easy access to information. The B.C. Drug Shortages web page complements PharmaCare’s collaboration with multiple stakeholders to ensure timely and efficient management of drug shortages. The Ministry of Health participates on a number of drug shortages task groups along with healthcare professionals, federal, provincial and territorial governments and industry to identify and develop strategies to manage drug shortages that impact jurisdictions in Canada. Good communication channels ensure that drug shortage information is shared quickly and thoroughly throughout the pharmaceutical industry, health care professionals, and all levels of government. If you order a drug and do not receive it, check first with your wholesaler or distributor to see if there is a shortage. If the distributor confirms a shortage, please call the PharmaNet Helpdesk at 1 800 554-0225 and report it. PharmaCare will confirm details with distributors and/or the manufacturer, determine appropriate alternate treatments, and arrange for temporary coverage of those treatments. If PharmaCare confirms that no shortage exists, you will be contacted. Please do not contact physicians regarding a shortage until it has been confirmed by PharmaCare and noted on the BC Drug Shortages list. Pharmacists play a critical role in the identification and subsequent management of drug shortages. If you have any questions about pharmacists’ duties and obligations during a drug shortage, please call the PharmaNet Helpdesk. Patients with inquiries about drug shortages should contact their pharmacist.